Application: Pick up customer's banding material from a flat (eye to the sky) orientation and rotate it up 90 degrees to load onto an unwind machine. 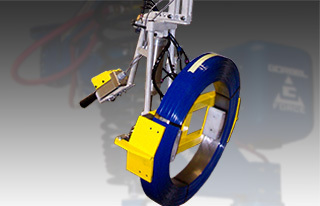 Problem: Customer would have a full skid of banding material delivered to an unwind station. The banding material weighed up to 105 pounds, and the operators had to move each spool 2-3 times per hour. The operators were lifting this by hand. Solution: Due to the tight tolerance of the loading, it was ideal to have an intelligent assisted lifting device for the vertical travel. The tight space also required an articulated arm to allow freedom of movement without the fear of hitting the walls. The device was equipped with a pneumatic grip with a powered 90 degree pneumatic rotation. 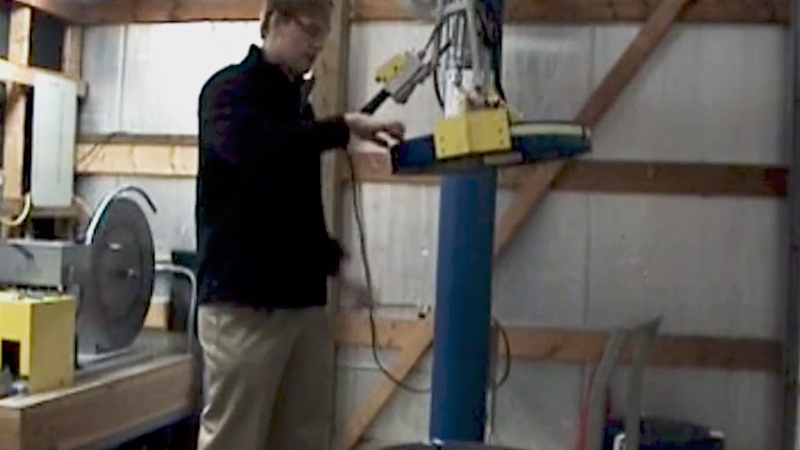 Combined with the Gorbel Easy Arm for lifting, this pneumatic lifting device took the entire load off the operator. Result: The customer/operator in the area was incredibly relieved by the amount of stress this pneumatic lift assist took off his body. Within a month of having it, a sign was made specifically for Ron the operator. They dubbed this unit "The Ron Lift" because he apparently couldn't stop talking about it.